I review books by many new authors, many smart young foodies and quite a few old stagers, who each have lots to offer the culinary opus. Elizabeth David is, depending on your viewpoint, either a shining star in a dazzling firmament or a treasure island in the sea of mediocrity. It’s true that Elizabeth David has long (we are talking decades) been quoted and revered by the worthy and wise of the food industry. She is considered the Grande Dame of British cooking… or more accurately the British Queen of (not necessarily British) cooking. She wasn’t a Mrs. Beeton (too racy) or a Delia Smith (more a wordsmith) but she holds a place of high esteem in the mind of anyone who knows a fig about cooking. An Omelette and a Glass of Wine is a book to dip into like a fine stockpot. It’s a book of collected articles and associated recipes that show the skill of this woman to great advantage. They were written between 1955 and 1984 for publications as diverse as Gourmet magazine and The Spectator. Each chapter holds a little gem of observation and wry humour. Yes, the food landscape has changed, both in Britain and in France, but this volume is still relevant and absorbing. 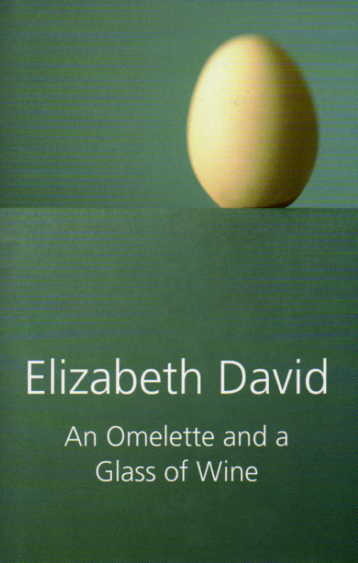 The Omelette immortalised in these pages is one cooked in the restaurant Molière (this is Elizabeth David so it wouldn’t be a bacon buttie in The Dog and Duck). She writes: “… Physically and emotionally worn to tatters by the pandemonium and splendour of the Avignon market, tottering under the weight of provisions we had bought and agonizing at the thought of all the glorious things which we hadn’t or couldn’t, we would make at last for the restaurant Molière to be rested and restored.” Then follows the recipe for a simple but delectable omelette. Not fussy and over-garnished but perfect in form and flavour. An Omelette and a Glass of Wine will never be considered passé. It has an abundance of recipes for food lovers who want to cook, and has a wealth of anecdotes for cooks who want to dream. It’s a pleasure to read and reread, and a must for wanabe food writers.